Sonoma State University, in a full day of free activities open to the public, celebrates the formal installation of Judy K. Sakaki as the University's seventh president at campus-wide Investiture ceremonies Thursday, April 20. Beginning with the 9 a.m. Mini-Conference showcasing some of the University's most compelling academic accomplishments around the themes of sustainability, diversity, community engagement and global perspectives, Investiture Day culminates with a free, evening concert at the Green Music Center by the popular jazz fusion group, Hiroshima. "It is the honor of a lifetime to lead Sonoma State," President Sakaki said. "Investiture is a wonderful opportunity for us to talk about the university's future and draw attention to some of the excellent and transformative work being done by our students, faculty and staff." The Investiture theme is "Dance with Change," and President Sakaki will touch on her new campus initiatives and vision for the University's future after being officially sworn in by California State University Chancellor Timothy White. That portion of the day's events takes place in Weill Hall at the Green Music Center from 2 to 4 p.m. and will be followed by a reception at the GMC's Trione Courtyard. Michael Drake, a mentor of President Sakaki's who is a former chancellor at the University of California, Irvine and current president of The Ohio State University, will deliver the keynote address. A number of dignitaries, including members of the CSU Board of Trustees and presidents from other CSU campuses, are expected to attend. Most of the Mini-Conference's 50 presentations, performances and sessions will be held in the Student Center between 9 a.m. and noon. Other locations include the Darwin Hall Lobby, University Art Gallery, University Library and Seawolf Plaza. A full schedule of the events is available at the Investiture website. Contemporary jazz masters, Hiroshima, perform at 7:30 p.m. in Weill Hall at the Green Music Center. Although admission is free, tickets are required. Investiture, held during a president's first year in office, is a longstanding academic tradition where a new leader is vested with the official powers of the presidency. 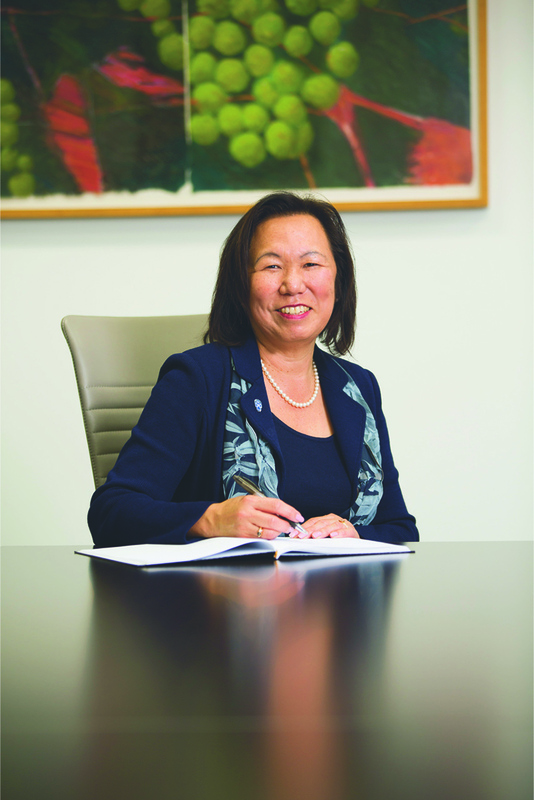 Dr. Sakaki began serving as Sonoma State president last July after a long career overseeing student affairs at Fresno State, UC Davis and the UC Office of the President. She is the first Japanese-American woman in the nation to lead a four-year university and has devoted her entire career to issues of inclusion, educational opportunities and achievement for all students. An exhibit at the University Library, titled "I am because... Dr. Judy K. Sakaki's Journey to the SSU Presidency," tells the story of how President Sakaki's life was shaped by people and events and includes many compelling personal artifacts. The exhibit is open all day and runs through the summer. It was curated by Dana Ogo Shew, a Sonoma State archeologist and oral historian. This year marks the 75th anniversary of President Franklin D. Roosevelt's executive order leading to the internment of about 120,000 men, women and children of Japanese ancestry. Many of those interned, including Dr. Sakaki's mother and father, were born in the U.S. and were American citizens. Another highlight of Investiture Day will be the first public performance of a new Sonoma State alma mater. The music was composed by Brian S. Wilson, a Sonoma State professor of music and chair of the department. Lyrics are by Brantley Bryant, a Sonoma associate professor of English and department chair. As a young girl growing up in a diverse neighborhood in East Oakland, Sakaki never imagined attending college, let alone making a career as an educator. But a chance meeting with a college outreach worker opened her eyes to the possibility and she went on to earn two degrees from what is now CSU East Bay. She later earned a Ph.D. in education from UC Berkeley and uses her story to underscore how a quality education can transform people's lives. The day's festivities are being underwritten by sponsors that include the Press Democrat, Willie and Darlene Tamayo, Chandi Hospitality Group, Sally Tomatoes at SOMO Village Event Center, 256 North Restaurant, LaTortilla Factory, Redwood Credit Union, Clover Sonoma, Costco in Rohnert Park, Ted and Peggy Elliott, Martin Ray Vineyards and Winery, Sonoma Cutrer Vineyards, Wilson Artisan Wineries, Biagi Brothers, Exchange Bank, Sutter Hospital and the SSU Alumni Association. • Lots M, N, O, and P directly adjacent to the Green Music Center provide closest general and disabled parking. Lots G and H are also within walking distance. • A full schedule of activities and information about how to obtain free tickets for the evening concert can be found online at www.sonoma.edu/investiture. The School of Business and Economics at Sonoma State University has been ranked No. 7 in the Top 25 Business Schools and No. 20 in the Top 25 MBA Programs in California by Top Management Degrees.